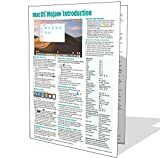 Four page laminated quick reference guide showing step-by-step instructions and shortcuts for how to use macOS Mojave. Written with Beezix's trademark focus on clarity, accuracy, and the user's perspective, this guide will be a valuable resource to improve your proficiency in using macOS High Sierra. This guide is suitable as a training handout, or simply an easy to use reference guide, for any type of user. Switching Between Running Apps or Windows; Quitting an App; Quitting a Frozen App; Ejecting Drives, Discs, or Servers; Adding an App to the Dock; Moving the Dock; Hiding the Dock; Using Stacks; Customizing the Menu Bar; Finding Keyboard Shortcuts for Menu Items; Switching Between Light and Dark Mode. Installing New Apps: Installing New Apps; Updating macOS & Purchased Apps; Other App Sources.